﻿ Psalm 6:10 Let all mine enemies be ashamed and sore vexed: let them return and be ashamed suddenly. All my enemies will be ashamed and shake with terror; they will turn back and suddenly be disgraced. As for all my enemies, they will be put to shame; they will be greatly frightened and suddenly turn away ashamed. A Davidic psalm, which he sang to the LORD, because of the words of Cush the descendant of Benjamin. All my enemies shall be put to shame and greatly troubled. They shall turn back. They shall be put to shame suddenly. All mine enemies shall be put to shame and sore troubled: They shall turn back, they shall be put to shame suddenly. Let all my enemies be ashamed and sorely troubled; let them turn back and be put to shame suddenly. Let all those who are against me be shamed and deeply troubled; let them be turned back and suddenly put to shame. All mine enemies shall be ashamed and tremble exceedingly; they will turn, they will be ashamed suddenly. All mine enemies shall be ashamed, they shall tremble exceedingly they shall turn back, they shall be ashamed suddenly. 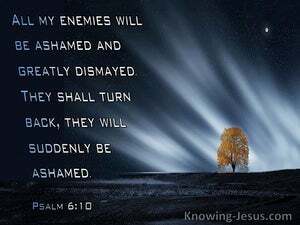 Let all my enemies be ashamed and greatly troubled: let them return and be ashamed suddenly. All my enemies shall be ashamed and shall be very terrified. They shall turn back; they shall suddenly be ashamed. Let all my enemies be ashamed and exceedingly troubled; let them turn back and be ashamed in a moment. All mine enemies shall be confounded and sore vexed; they shall be turned back and put to shame suddenly. May all my enemies be humiliated and absolutely terrified! May they turn back and be suddenly humiliated! May all my enemies be ashamed and dismayed. They shall turn back, they shall be disgraced suddenly. Let all my foes, turn pale and be greatly dismayed, Again let them turn pale in a moment. Let all my enemies be ashamed and greatly disquieted: let them return and be suddenly ashamed. 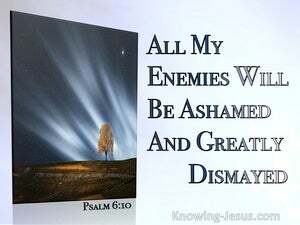 Ashamed and troubled greatly are all mine enemies, They turn back -- ashamed in a moment! 9 The LORD hath heard my supplication; the LORD will receive my prayer. 10 Let all mine enemies be ashamed and sore vexed: let them return and be ashamed suddenly.